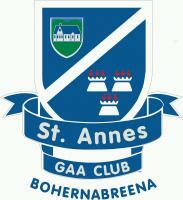 Click on the photos below for more information St Annes AGM Thursday 31st of January in Club Bar at 8pm. 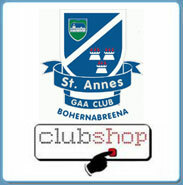 All Committee nominations to be returned to club secretary by 9pm Thursday 24th of January. Forms are in the bar. 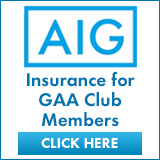 Club Lotto 2018-2019 tickets are now on sale. 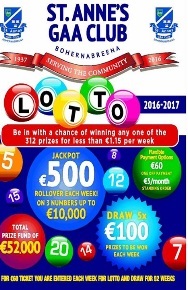 At €60 each for the year win a share of our total prize fund of €52,000 over 52 draws, this is great value, so please contact Ciara on 087 6424065 for tickets and further details. Get fit with Kim ~ Every Tuesday and Thursday morning at 11am and Tuesday evenings at 5pm. €6 per Class.€22 per month for one class per week.€45 per month for two classes a week.FIRST CLASS FREE!! !Discount for Anne's Members.